This week our Patient Safety Team met at a bakery in Bristol to review the progress of the West of England Patient Safety Collaborative over the last year and to plan for the future. We know from our latest stakeholder survey results that 94% of colleagues who received our support around patient safety work found it valuable. We were able to evidence the first time in the West of England that a patient has been referred from primary care through the ambulance service into the emergency department (ED) using their NEWScore at every handover, showing that change had reached the whole system. It’s brilliant that the patient got the right treatment quickly and got better before leaving ED. The impact of our patient safety projects are having a large-scale reach across the system: nearly 3,000 referrals were made using PharmOutcomes from hospital to community pharmacies; over 1,600 staff received training in human factors this year; 53,756 patients received a NEWScore at triage into ED; 830 patients have benefited from our emergency laparotomy collaborative; and 246,161 patients were treated using the electronic patient record by the ambulance service. The breadth of our patient safety work has reached all sectors: primary care, community health and social care, acute care, community pharmacies, ambulance services, out-of-hours, and mental health trusts across the system in the West of England. The team made plans for 2017 and beyond. Keep an eye out in the new year for more details and to book onto our collaborative events. 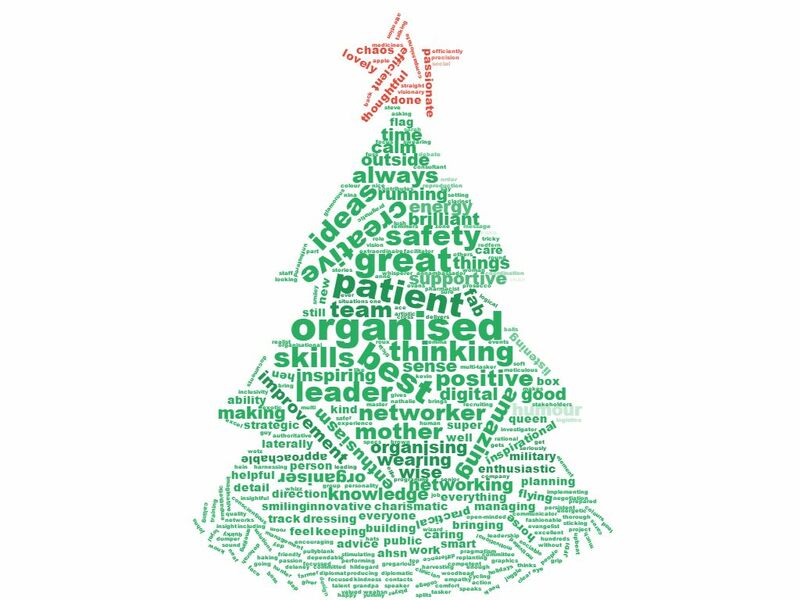 All team members were asked to share in advance what they valued about their colleagues and these comments form the word cloud in the shape of a Christmas tree at the top of this post. From everyone in the Patient Safety Team we wish you a very happy, merry and safe Christmas with all the best wishes for 2017!